Fifteen-year old Reigh, a human boy raised in an elven world, has never known what it feels like to belong. 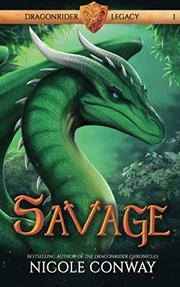 In his jungle home of Luntharda, the gray elf kingdom, he works with his adoptive father, Kiran, as a healer. But Reigh also carries a secret: there’s a powerful force within him that he is unable not only to understand, but also to control. Kiran has always insisted that Reigh keep the news of this power to himself, but as Reigh gets older, it becomes harder to do so. Luntharda has known peace for decades thanks to the dragon-riding human hero Jaevid Broadfeather. Forty years ago, Jaevid ended the Gray War and brought amity to Luntharda and human Maldobar, but now enemies threaten the citizens of Maldobar with destruction. A failed effort to get assistance from the elven people and the failed attempt to resurrect Jaevid from his divine sleep have the fate of Maldobar looking grim. Will Reigh rein his power in in time to become the hero his world so desperately needs? Conway offers immersive worldbuilding, creating a familiar-feeling, mostly white high-fantasy setting that’s balanced by Reigh’s colloquial voice. The narrator’s journey of self-discovery feels honest and compelling even in his moments of immaturity and recklessness, and relationships among the characters feel complex and real.